Squirrels are among the most common animals on the planet, with more than 279 species worldwide in habitats ranging from city parks to forests. These small animals use a variety of complex signals to communicate with each other, including visual cues, scent and complex vocalizations. Vocal signals are a major component of squirrel communication; they fall into four main categories: nesting, mating, aggressive, and warning calls. Baby squirrels use small cries to call for their mother, and a male squirrel chasing a female during mating season will use a series of calls that sound like sneezes to get her attention. A severely frightened squirrel will let out a small, shrill scream, while a squirrel under threat may warn each other with a number of sounds that vary depending on the present danger or intrusion in their territory. Squirrels are distinguishable from other rodents by their large, fluffy tails, which serve a number of purposes, from temperature regulation to visual distraction when facing predators. A ground squirrel confronted by a rattlesnake will wave his tails back and forth in an effort to intimidate or confuse the snake by creating the illusion of a bigger body mass through rapid tail movements. A squirrel may also rapidly shake his tail when upset or frightened. In addition to shaking and waving his tail, a squirrel uses body language to convey his state of emotion. An erect or relaxed posture is an indication of alertness; foot-stomping accompanying tail-thrashing is indicative of facing down an enemy. Much like dogs, squirrels use scent to mark their territory and leave clues for other squirrels who may wander by. They deposit scents by rubbing cheeks or scent glands on trees, usually after gnawing on the bark or on exposed roots. 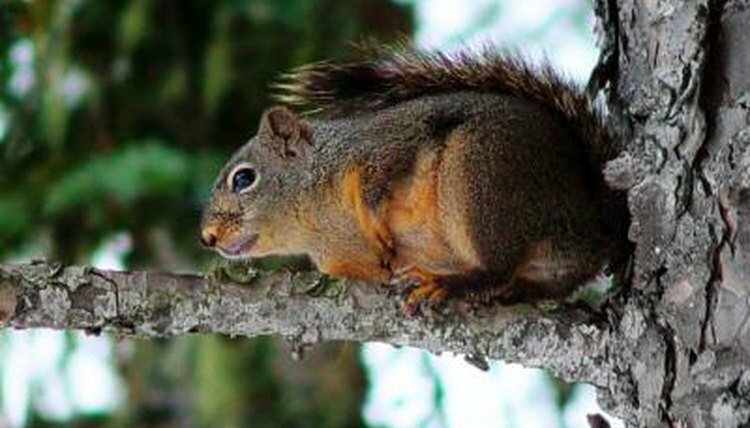 The scents that squirrels leave behind can indicate territory boundaries, stress levels, social hierarchies within the territory and reproductive availability. Wild Mammals of North America: Biology, Management, and Conservation; George A. Feldhamer et al.